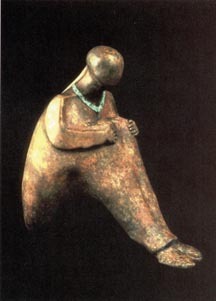 Nora Naranjo Morse (B.A.,College of Santa Fe) is a member of the Tewa tribe, is a metal sculptor and writer, and resides in Santa Clara Pueblo, New Mexico. Her most recent work is featured in the Heard Museum, in a Native American Women's exhibit called "Watchful Eye" sponsored by the Institute of American Indian Art. See more work by Nora Naranjo Morse published in Weber Studies: Vol. 18.1.